These grain-free raspberry coconut cupcakes are easy to make, yield a small batch and have a dairy-free option. I made these grain-free raspberry coconut cupcakes back in January after Mr. Texanerin had given me a few coconuts to use as props. I then made coconut everything. Raspberries were also on sale and I don’t care where they’re from – if raspberries are 99 cents a container, they’re coming home with me! You can’t make these with whole wheat flour so I looked around for a whole wheat coconut cupcake recipe to share with you. Only it seems like coconut cupcakes are not all that popular. Muffins, yes, but not cupcakes. These coconut cupcakes look promising! I’d use white whole wheat flour, though. I used Greek yogurt in these but as always, you can use this dairy-free coconut Greek yogurt for a dairy-free version! 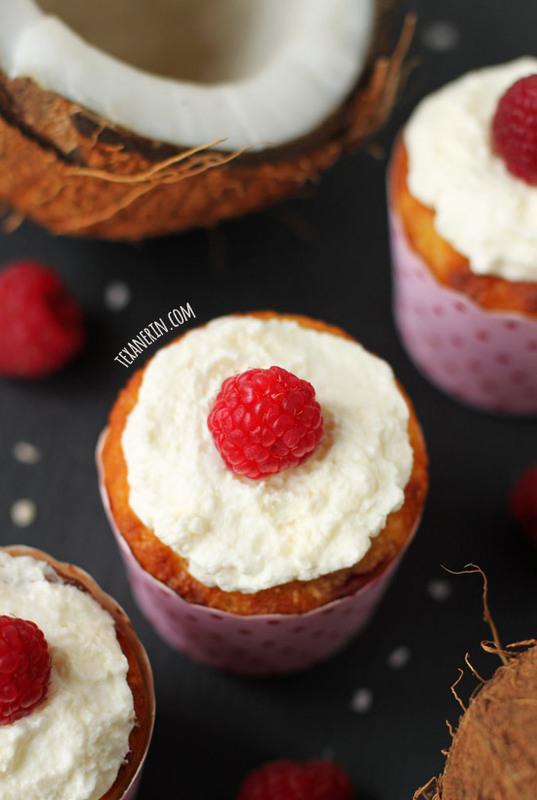 Or you could make these grain-free + dairy-free coconut cupcakes and toss in some raspberries. I have no idea why I didn’t do that myself! For another awesome gluten-free summery cupcake, try these Gluten Free Double Chocolate Marshmallow Cupcakes from My Gluten-free Miami! Preheat the oven to 375°F (175°C). Line a cupcake pan with 8 cupcake liners. In a medium bowl, mix together the dry ingredients (almond flour through salt) and set this aside. In another medium bowl, mix together the coconut oil through Greek yogurt. Put the chopped raspberries (that have been patted dry!) in the bowl that you had the dry ingredients in. Add the teaspoon of coconut flour and coat the raspberries in the flour. Fold the raspberries into the batter. Do not over mix or the resulting cupcakes will have a bad texture. Bake the cupcakes for 15 - 18 minutes or until a toothpick inserted in the middle comes out clean and the cupcakes are firm to the touch. Let them cool for 5 minutes in the pan and then turn the cupcakes out onto a wire rack to cool completely. Put a can of coconut milk in the refrigerator, being careful not to shake it. Let it sit overnight. Take the can out of the refrigerator and pour the liquid (it should be watery) into another container to use later (perhaps in a smoothie!). Place the remaining thick cream in a medium bowl and whip with a hand mixer until it's the consistency of regular whipped cream. Add powdered sugar to your liking, starting off with a tablespoon. Spread on the cupcakes and serve. Use dairy-free coconut Greek yogurt for a dairy-free version. 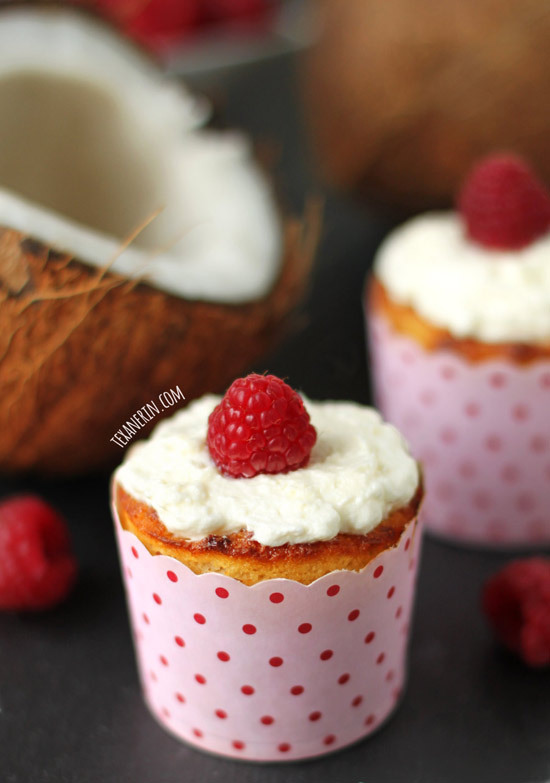 33 comments on “Raspberry Coconut Cupcakes (grain-free, gluten-free, dairy-free)” — Add one! I haven’t tried it but I’m guessing they might be a little soggy after defrosting. Sorry about that! These look awesome! Do you have any suggestions for replacing the eggs to make these vegan? Thanks! I normally like to use chia eggs but not in grain-free cake or muffin recipes (though cookies are fine!). So I’m not too hopeful that an egg replacer would work in these. Sorry about that! Just checking, the method says to add strawberries but they’re not listed in the ingredients, is it a typo or are there strawberries and raspberries or just raspberries? Thanks for pointing that out! It’s just raspberries. :) I’ve fixed it! Thanks, about to make them now for my mum’s birthday, I’m sure she’ll love them! 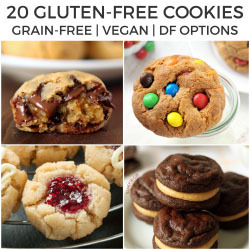 I want to make these for a gluten intolerant friend. Are these gluten free? The tag says so but I want to make sure! thanks for posting such a yummy looking recipe! Thanks Erin! I just wasn’t sure if grain free and gluten free were the same thing, thanks for clarifying! This recipe looks amazing and I want to try making it for my gluten free sister. BUT, where can I find full fat cans of coconut milk? I’m finding 15 oz cans of cream of coconut (like you use for drink mixers) or cartons of coconut milk (like the almond milk counterparts). Will either of these work? Gorgeous!! I agree – cupcakes are good travelers ;) You know you’re way to my heart Erin — another grain free recipe- wahey!! After making the Choc/Banana muffins which were a triumph, I thought I’d try these. They’re in the oven. After licking out the mixing bowl I think I will add some lemon zest next time. Just to lift it a little. Thanks for sharing your recipes. I hope you enjoyed them! And you’re right, lemon zest sounds like a good thing to add here. :) I was just a little worried that it’d be weird with the coconut but now that I think about it, lemon and coconut sounds great together. :) Thanks for the tip! So much coconut and raspberry goodness happening. And they look so moist! The inside of those cupcakes looks SO dreamy! I have no idea why coconut cupcakes aren’t the most popular thing ever, I love em. Oh yes! 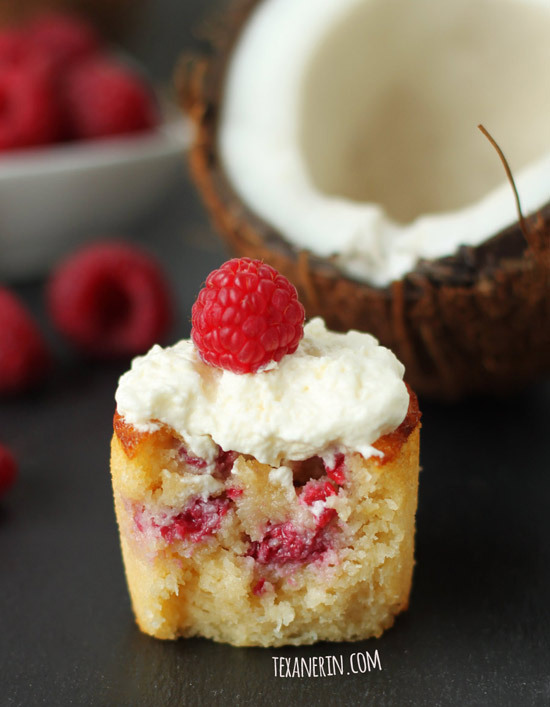 I’m all about raspberries and coconut, and together in these cupcakes sounds like my heaven. Pinned! This recipe sounds special enough to be a birthday cake! I just picked 25 pounds of raspberries so here’s one option for me. Thanks for sharing.